Wow…. like that corner table with the table lamp and the way it is arranged. I hope your daughter's delivery goes smoothly be it tmr or sooner or later! 🙂 Im sure you are all waiting with happy anticipation! What a loving commitment you and your husband have been part of last few weeks with the long drives and busy schedules. I'm sure it meant so much to John's aunt during her last days. 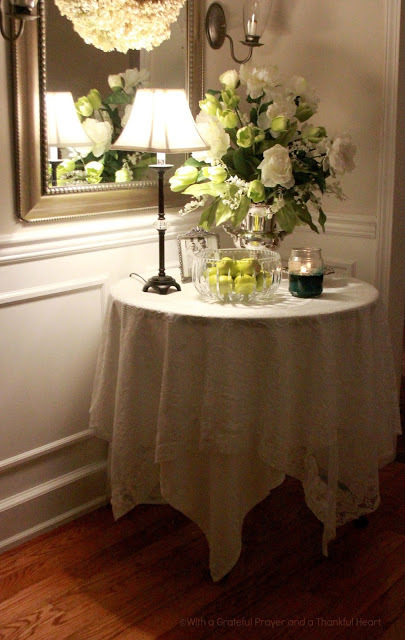 Oh and you're quite an interior designer – your foyer looks like it belongs in a magazine! Your home always looks so beautiful, thank you for sharing. Lorraine, I miss you! I have been praying for you in your many roles. You must feel pulled in them all. Just wanted you to know today. Your foyer looks beautiful. You have such a sense of style. Sorry to read of the hospitalization but hopefully the new baby has arrived by now. Yes, life gets busy with many ups and downs. Thinking of you Lorraine. Your foyer looks lovely. It is fallish with such a pretty coloring. Very elegant. I'm sorry for your loss. How exiting that you will have a new baby in your life. Life is bittersweet, isn't it? 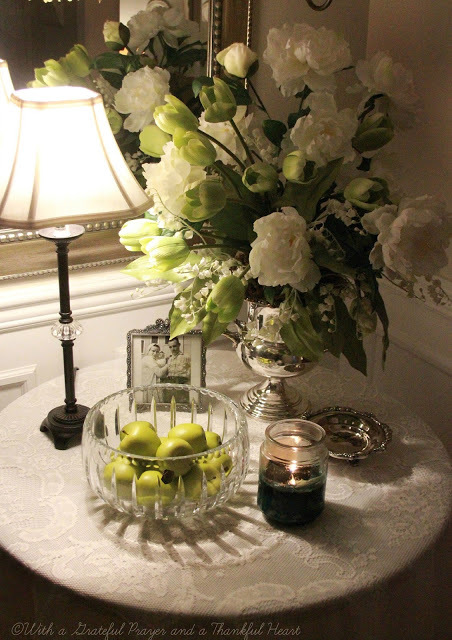 I like how the green color coordinates in the apples and the flowers. Sorry to hear about the death and joyful to hear about the birth; the full cycle of life. 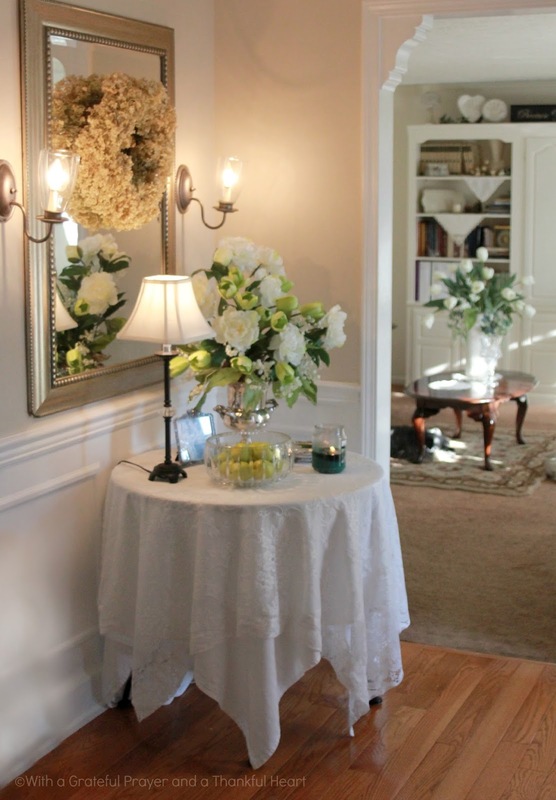 Your foyer looks lovely and elegant. A lot is happening in your life – remember to breathe! That is just so elegant! Sorry on your loss and blessings on the new grand child. Life does have full circles. 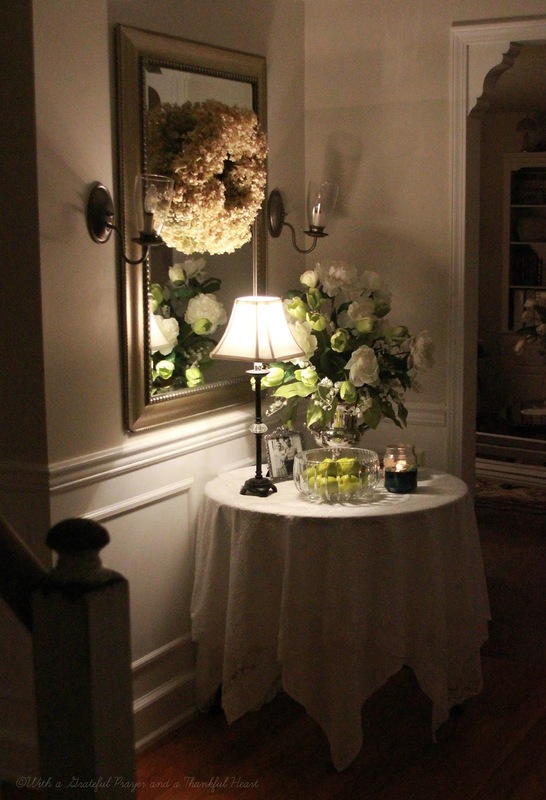 Your foyer looks absolutely gorgeous..both at night and in the morning! The foyer is so inviting. I love what you did. Very lovely indeed and yes, life can get so full and we hardly have time to catch our breath. Blessings to you during this "full time." Really like what you've done and all the green. Sorry about the aunt, the cycles of life right in front of you … one leaves this earth as another arrives. So beautiful. Forgot to ad you and John are in my prayers, saying "good-bye" and "hello" can be both challenging and some of our most cherished memories. I am so sorry for the passing of your loved one but rejoicing with you at the upcoming birth of another grandchild. The foyer looks lovely. I love changing furniture around for a fresh new look. My condolences to you and John on the loss of his aunt. 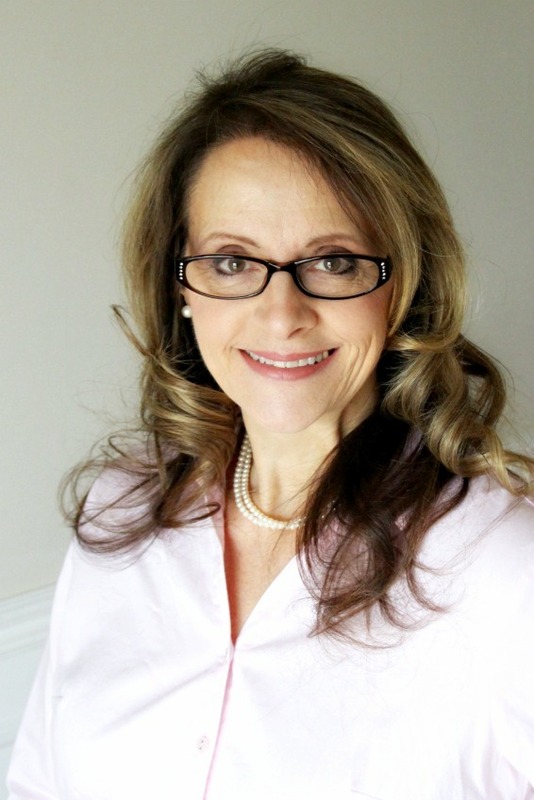 Oh- A funeral and a birth…the going out and the coming in as planned by God. Grief and blessings all part of our life plan. I love your foyer and I did see Raider soaking up the sunshine! It looks very elegant and very beautiful! Everyone of us in the blogging world would love to just "pull some things from our home", put them together in our foyers, and have them look that good! I like that look and think it is a lovely sight to greet friends and family. It says, "welcome" . So sorry to hear the news about John's aunt. You both have so much on your plate right now. Praying for you as you go through each day. 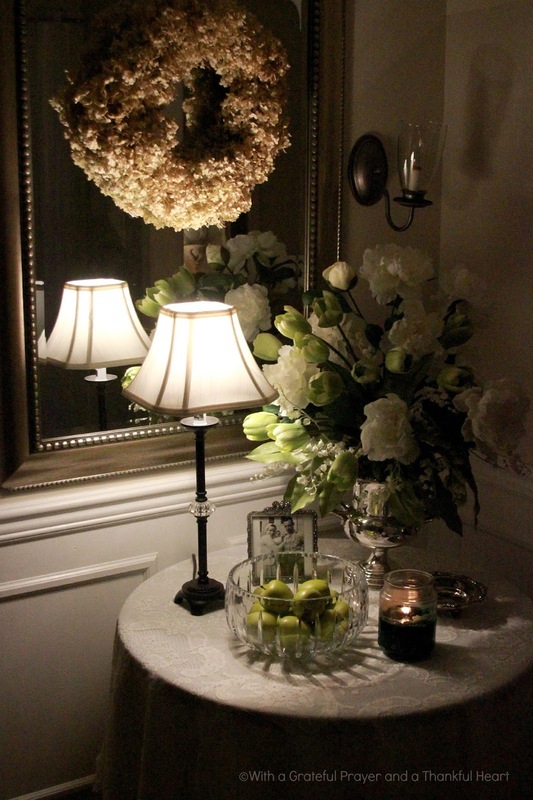 How beautiful, I love the wreath in the mirror! I'm sorry for your loss too, it's always such a hard thing to go thru, no matter how old our loved ones are. Blessings to you and your hubby. The rearrangement looks great. So sorry for your loss, but happy for the new addition. It reminds me of Job 1:21 about how the Lord takes away and He gives (except the verse is just the opposite). No matter what….blessed be the name of the Lord!!! Prayers for you and your family!